The idea behind members’ BookNights is to have a thoroughly good time, encourage reading and discussion, and to end the night both happier and wiser than when it began. For more information about membership and the other benefits on offer, please contact membership coordinator Sophie Kayes. For June’s BookNight we are pleased to welcome author and special advisor at Human Rights Watch Fred Abrahams, who will present his book Modern Albania From Dictatorship to Democracy in Europe over an intimate dinner with Frontline Club members. You can now order Modern Albania with a 20% discount. Please use this code to claim your discount: CSF615MALB. 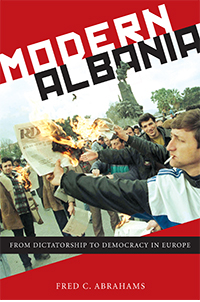 Modern Albania offers a vivid history of the fall of the Albanian Communist regime and the trials and tribulations that led the country to become the state it is today. The book provides an in-depth look at the Communists’ final Politburo meetings and the first student revolts; the fall of the Stalinist regime and the war in neighbouring Kosovo; and the relationship between Albania and the United States. A rich, narrative-driven account, Modern Albania gives readers a front-row seat to the dramatic events of the last battle of Cold War Europe. Fred Abrahams is a writer who has worked for twenty years in areas marred by political crises and armed conflict, including the Balkans and the Middle East. In Modern Albania, he weaves together interviews with key Albanians and international parties who have played a role in the country’s politics since 1990. Guests will be expected to have read the book, and to be ready and willing to contribute to the conversation. This will be an in-depth discussion rather than a standard format Q&A. The evening will start with drinks at 7:00 PM, following by a sit-down dinner at 7:30 PM. We will get to know one another over starters before the introduction of the evening’s guest author.